5G / Deep / 25.50 mm / Slightly wider, gradually lowered to outside. / Same as No.350-5 except for .276" throat and #429 backbore (same as No.341-5G but with small shank). 6-1/2AL / Medium deep / 25.40 mm / Medium wide, well rounded. / The same rim and cup as No. 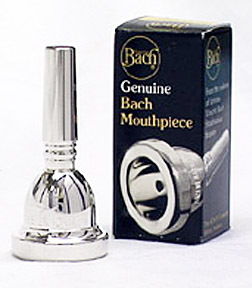 6-1/2A, but with a larger "G" throat and #420 backbore for trombonists who strive for a Teutonic tone quality. Recommended for euphonium players who desire a round, mellow tone of great carrying power and substantial volume.